Are Days of the Week Capitalized? You might be skeptical, but the answer is yes! Days of the week are capitalized. It does not matter where the day of the week falls in a sentence, it should be capitalized whether it is in the middle or end of a sentence. The question is why? So, Why Are Days of the Week Capitalized? Why should we capitalize days of the week? Simple, all days of the week are proper nouns and any proper noun like your name, name of a place, or event must start with a capital letter. For instance, Monday is a noun and not just a common noun like girl or dog, but a proper noun naming a specific thing and in this case a specific day which is Monday. So, when writing, you use the day of the week as a proper noun to emphasize the day. In this sentence we see that Tom is a proper noun because Tom is a name of a person and Tom is Tom nobody can replace Tom with anything so the same goes with Monday. Monday or any day of the week is a name of a specific thing. Monday is Monday and cannot be changed. Nouns especially proper nouns like Tom or Monday are names of things that are unchangeable. A proper noun cannot change. What About Capitalizing the Word “Day”? This sentence can change when we write it this way. “The boy will arrive any day.” As you can see, boy and day are nouns but in this case, they are common nouns. They are not capitalized “day” can refer to any day, not just a specific day like Monday. The boy could also arrive on Tuesday or Wednesday. Also, boy is lowercase because a boy is not specific person like Tom. A boy can be any boy and a day can be any day and not a Monday! The secret is that proper nouns like Dubai (which is a name of a place), Monday (day of the week) or Tom (name of a person) are things that cannot be changed. So, when they are used in a sentence, the user wants to specify and emphasize on the instructions of the sentence. Proper nouns are easy to identify in a sentence because every sentence with a proper noun has some authority of a certain magnitude. So, in our sentence, “Tom is coming on Monday,” the writer wants us to know that it is Tom who is coming and not any boy and he is coming on Monday and not any day. The writer is being specific. With this explanation, we believe you are now able to differentiate between proper nouns and common nouns and you are now able to confidently write days of the week in capital letters wherever they appear on a sentence. In conclusion, days of the week should be written in capital letters when they are named. 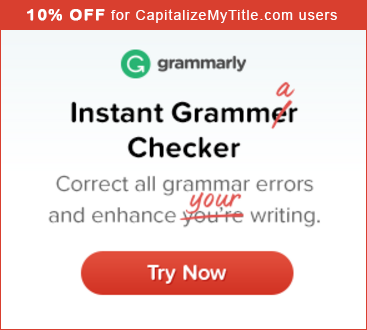 To check the capitalization of more words, check out our free title capitalization tool. Previous articleIs Valentine’s Day Capitalized? Next articleIs bachelor’s degree capitalized?